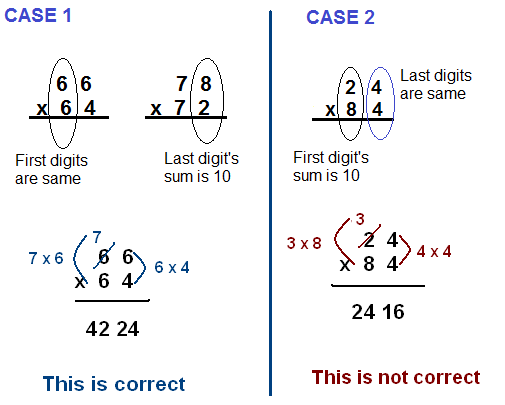 In this article, we shall discuss a very common and interesting trick to square those numbers quickly which are having '5' as last digit. For example, what is the result of 652, 852, 1252 ? Let us start with an example:- 35 x 35. How will you multiply? In first step, we multiply 5 by 35, get 175 and wrote it below the line. In second step, we multiply 3 by 35, get 105, wrote it below the first step and leave one space from right. In last, we add results from both the steps and get 1225 as answer. Now here is the magical trick or quicker way to do this calculation using Vedic Math (to square any number with a 5 on the end). Let us have a look on the same example once again, following 'Vedic Math' steps to solve it. In 35, the last digit is 5 and other number is 3. Add 1 to the top left digit 3 to make it 4 (i.e. 3+1=4) (See the image below). Then multiply original number '3' with increased number i.e. '4'. Like 3 x 4, and we get 12. Now you can see that this is the left hand side of the answer. Next, we multiply the last digits, i.e 5 x 5 and write down 25 to the right of 12. Visual representation is given below. I'm going to explain the magical trick method once more. Add 1 to the top left digit 10 to make it 11(i.e. 10+1=11). Multiply the original left hand side number with its successor number i.e. 10x11, and we get 110. Write this on the left hand side. Multiply the last digits, i.e 5 x 5 and write down 25 to the right of 110. So you can see how easy it is to square the numbers which are ending with a 'five' (5) digit! In fact, if you memorize this technique and practice it, eventually you would be able to perform these calculations verbally (in mind). Just multiply the non-five number (left side number) with its successor number and put outcome on the left side. 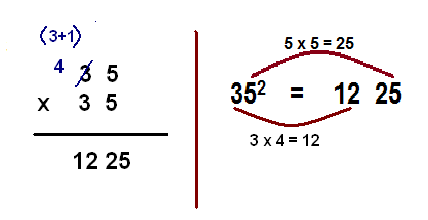 Multiply the last digits (5 x 5) and put 25 on right side of the previous multiplication. You try the above examples and I'm sure that you will solve these problems fast or might be orally. The technique of squaring numbers ending with 5 is a very popular technique. With this technique, you have used the formula (sutra) "By One More Than the One Before" , which provides a beautiful and simple way of squaring numbers that end by 5. The ALGEBRA behind this method is (ax+5)2 = a(a+1)x2 + 25, where x=10. Now here the question arises in your mind that: Is this formula applicable to a number that ends with 5 only? Answer: It is not applicable to all kind of multiplications. But you will be happy to know that the above formula can be applied to the multiplication of numbers whose last digits add to 10 and the remaining first digits are the same. But remember, same rule is not applied on the vice-versa i.e. if last figures are the same and the first figures add up to 10. See the image below. So same rule is applicable for case 1, but not for case 2. We will take one more example of the same kind. Here we can see that right digits sum is 10 i.e. (9+1) and left side digits are same. So we can now apply the same method. First, multiply the right side numbers(1 x 9) and the result is 09. Second, multiply 6 by the number that follows it, i.e.7, so the result of (6 x 7) is 42. And now the final output is 4209. Now, following are some of the problems for your practice. So this is all for today. Hope you have enjoyed the 'Vedic Math' tricks. We shall come up with more tricks soon. I have one doubt and my doubt is how to multiply 91*99 using vedic maths please tell me as soon as possible. i have one doubt and it is, how to multiply 91*99 using vedic maths please help. 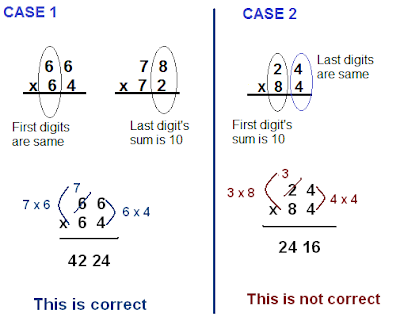 For this we use formula - "Multiplication of numbers whose last digits add to 10 and the remaining first digits are the same"
1.First, multiply the right side numbers(1 x 9) and the result is 09. 2.Second, multiply 9 by the number that follows it, i.e.10, so the result of (9 x 10) is 90. 3.And now the final output is 9009. I hope it will be clear now. Split the answer in two parts. For first part of the result, reduce the multiplicand (91) by 1 i.e. 91 - 1 = 90. And for last part, Subtract the multiplicand (91) from 100 (multiplier + 1). Therefore, (100-91) is 09. How to write this problem using c++ program?